South Palm Orthopedics offers total orthopedic care. We treat a variety of orthopedic conditions encompassing six subspecialties, and we provide a variety of services all in our state-of-the-art facility. We understand that your time is precious and that you lead a busy life. Our goal is to get you well and back to your regular routine as quickly as possible. To that end, we conveniently provide a variety of services all under one roof. From on-site diagnostic and treatment tools such as X-ray and fluoroscopy to our on-site, state-of-the-art physical therapy center, South Palm Orthopedics offers the finest in comprehensive orthopedic care. For an appointment, call today or you can request one online. 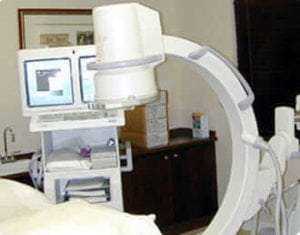 Radiography, known to most people as X-ray, is the oldest and most frequently used form of medical imaging. X-rays are diagnostic images that have been created by passing small, highly controlled amounts of radiation through the human body, capturing the resulting shadows and reflections on a photographic plate. 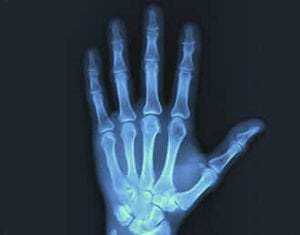 Probably the most common use of X-rays is to assist in identifying and treating fractures. X-ray images of the spine, joints, and extremities are performed every day at South Palm Orthopedics, eliminating the need to go to a diagnostic facility to determine the severity of an injury. Images of an injury can show our doctors even very fine hairline fractures or chips, while images produced after treatment ensure that a fracture has been properly aligned and stabilized for healing. Bone X-rays are used as an essential tool when we perform orthopedic surgery, such as spinal repair, joint replacements, or fracture reductions. At South Palm Orthopedics, we utilize advanced modern digital X-ray equipment for the best image quality. Digital X-rays are superior to traditional film X-rays because they provide larger, clearer, color-enhanced images that result in a more accurate diagnosis. In addition, the size and shape of the X-ray system allows for faster and easier positioning that can lead to less stress for injured or ill patients. Digital X-ray also uses up to 90% less radiation than traditional X-rays. At South Palm Orthopedics in Delray Beach, Florida, we offer comprehensive treatments for a variety of orthopedic conditions and perform many minor procedures right in our office. The Delray Beach Surgery Center is a state-of-the-art ambulatory surgery center located right on campus, next door to South Palm Orthopedics. The center offers same-day surgery and features 3 operating rooms, a GI suite, and the latest in cutting-edge medical equipment and surgical devices to allow physicians to perform the most effective technique for each case. The center is capable of handling multiple patients comfortably in the pre- and post-operative areas, and it has a highly trained professional nursing and support staff that is specially trained in the latest outpatient surgery techniques and recovery care. Specialties at the center include orthopedics, gastroenterology, ENT, ophthalmology, plastic surgery, urology, and general surgery. All of the physicians at South Palm Orthopedics are on staff at Delray Beach Surgery Center, offering you a convenient, professional outpatient surgery facility. Fluoroscopy is a radiology technique that takes a real-time "movie" of the body. A continuous X-ray beam is passed through the body part being examined and is transmitted to a TV-like monitor so that the body part and its motion can be seen in detail. At South Palm Orthopedics, fluoroscopy is used to the doctors are able to do any injections under X-ray guidance. Our fully equipped fluoroscopy suite allows us to do minor procedures and treatments right on site. This means that procedures that normally would have to take place in a hospital or pain management facility can be achieved in a more relaxed setting, right in our office. Ordinarily, when you're suffering from joint pain, it often takes an MRI to locate the source of your injury. This involves visiting a center, having the test, and waiting days for the result. In addition, many patients experience anxiety attacks, claustrophobia, and negative reactions during an MRI. Patients with metal implants – such as pacemakers and defibrillators – can't even use an MRI for diagnostic purposes. Now a new, revolutionary tool called the mi-eye 2™ is replacing MRI for diagnosing orthopedic injuries at South Palm Orthopedics. Dr. William P. Toole, a fellowship-trained orthopedic surgeon at South Palm Orthopedics who specializes in complex arthroscopic surgery of the shoulder, hip, and knee, uses the mi-eye to examine and easily visualize patient injuries and provide in-office analysis for faster diagnosis of many conditions. The mi-eye is a hand-held device that uses a miniature HD camera and a needle to provide visualization of a damaged joint in the knee, hip, or shoulder. The test allows for an accurate diagnosis, and even better, it requires no anesthesia or sedation. With the mi-eye tool, results are immediate – no more going to another facility to have the test and then waiting days for a result. Instead, the mi-eye procedure is performed in the comfort of our conveniently located Delray Beach office. The mi-eye is a great alternative for those who are claustrophobic or dread being enclosed in an MRI machine. Plus, by choosing the mi-eye, you're back to your active life at least two weeks sooner than when choosing to undergo an MRI. 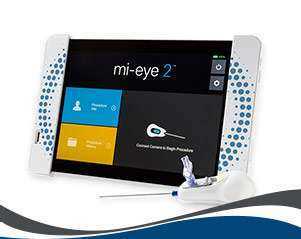 The mi-eye 2™ is FDA approved for use, and it is covered by most major insurance carriers, including Medicare. To learn more about the mi-eye and how this breakthrough technology can help in the treatment of your joint injury, call South Palm Orthopedics at to schedule an appointment today or use our online appointment request form.